For more than a century, professional wrestling has had men of all shapes and sizes compete in that squared circle. Fat men, thin men. Muscular men, out of shape men. Little men, big men. Perhaps two of the best big men of all time are "King Kong" Bruiser Brody and the Undertaker. Unfortunately they were a generation or more a part in terms their time in the ring. Undertaker was just starting out around the time of Brody's death. But these two did actually meet in the ring when they both worked for World Class Championship Wrestling. The Undertaker donned a mask and wrestled as "Texas Red." It was a sloppy encounter, and one of Taker's first matches. I dispute the date on this YouTube video though. The Internet is a great resource for information, but there are conflicting reports on the Undertaker's actual debut. At the end of this match they flash a graphic for Eric Embry appearing on the show, as well as Steve Simpson. If my memory is correct, neither man was a part of WCCW in 1984. Brody obviously went over in this confrontation. As most of you probably remember, the Undertaker was basically a big man jobber until he hit it big in the WWF in 1990. 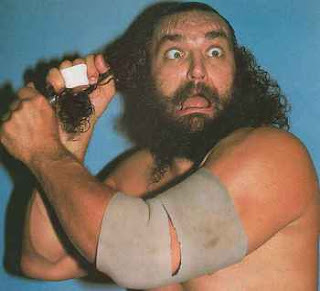 Although as the Punisher in WCCW he had some success. His stint in WCW was less than memorable. By the time the Undertaker had debuted in the WWF, Brody had been dead for more than two years, the victim of a locker room stabbing. Brody was also about 20 years Undertaker's elder, so if the two had ever met again, Brody would have been on his way down the ladder, with Taker just starting his climb to the top. Even though Brody never wore the NWA, AWA, or WWF world heavyweight titles, the big man did pick up gold in other territories and around the world. Clearly he was an international star and wrestled big names like Ric Flair, Harley Race, and Verne Gagne back in the day. He reminded me a lot of Andre the Giant, in that he did not need a belt to prove his worth in the ring. I recently wrote a post about Brody on the anniversary of his untimely death. Undertaker in the last 20 years has proven he may very well be the best of the big men to even step into the ring. Even with his body breaking down before our very eyes, he's able to put on an exciting match (albeit somewhat predictable) Imagine mid 80's Brody facing mid 90's Undertaker. As Gorilla Monsoon would say, "this match would be the main event in any arena." While I think Brody was always an incredible worker, I'd give the slight edge in this battle to the Undertaker. Although more likely if this match were to happen, it would go to a double disqualification, but in the world of Fantasy Friday, we have to pick a winner. So, I'm going to give the Undertaker the win, but this is by far the closest Fantasy Friday match I've booked. What are your thoughts? Who would win this epic fantasy battle? I'm curious to hear. Post your ideas here or on Facebook, Twitter, or YouTube.